Would love to expand and offer you more information on all back roads around the entire SouthWest, but technology is expensive. After 14 years online, I can safely says I need to hire some help. Intuit is offering a hiring grant and we need your vote to make it happen. 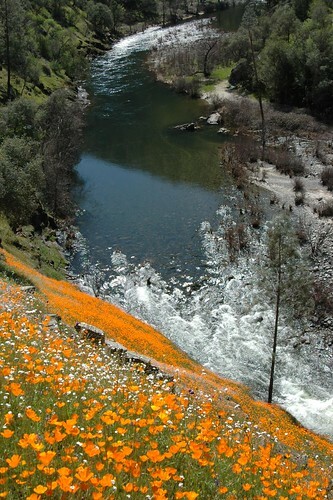 hite cove trail poppies and South Fork of the Merced River below a photo by Mrs Rachel on Flickr. Is it happening yet? Have you seen them? Where? Zillions of web sites and pages referencing wildflowers in California. The best imagery can be found on Flickr searches, which landed me on this incredible shot by Rachel. Total Escape covers California wildflower reporting starting in March each year.